As I’m trying to learn how to use Angular 2, I have compiled a list of useful resources that has helped me getting started using the framwork. This is half the solution. I sometimes get errors when I run npm install for my Gulp or Grunt projects. To retry I need to remove the node_modules folder and sometimes that causes problems as when you are on Windows. I had a look around and found a Git repository named rimraf. …and the node_modules folder will be removed. If you virtual machine is already running navigate to your Homestead folder and run the command vagrant provision to create the new database(s). If it is not running simply run vagrant up. You should now be able to access your new database with the default credentials. I initially set up my new ASUS RT-AC87U router with PPTP VPN but decided to go for the more secure Open VPN. I followed the instructions for this on ASUS’s website, but I was never able to get it up and running. I took a look around the web and finally I figured out how to make a setup that works. Here is how I did it. Visit the VPN settings of your router’s interface at http://192.168.1.1/Advanced_VPN_OpenVPN.asp (if you haven’t changed anything this should be the address to use). I’m hosting my sites with DigitalOcean (referral link) on the smallest VPS with 512 MB Ram. It’s a cheap way of hosting as I can have virtually as many sites I want on the VPS – and in case it is too slow I can easily upgrade it from the control panel. However, I occasionally get an error on my WordPress sites saying “Error establishing a database connection”. I searched around for a solution and finally found that I needed to add a swap file to the server. I accidentally stumbled upon a console named Babun. It is based on Cygwin so if you like a Linux like environment you should definitely check it out. It comes with a lot of cool packages installed and uses the fabulous oh-my-zsh as default shell. Download Babun and run install.bat – wait for a couple of minutes. Once installation has finished Babun will automatically start. To style Babun edit the oh-my-zsh configuration by typing nano .zshrc . It is recommended to set the Google Analytics Property ID as a variable in so you can easily reuse it in Google Tag Manager. But what if you want track to a different property if you are in debug mode? 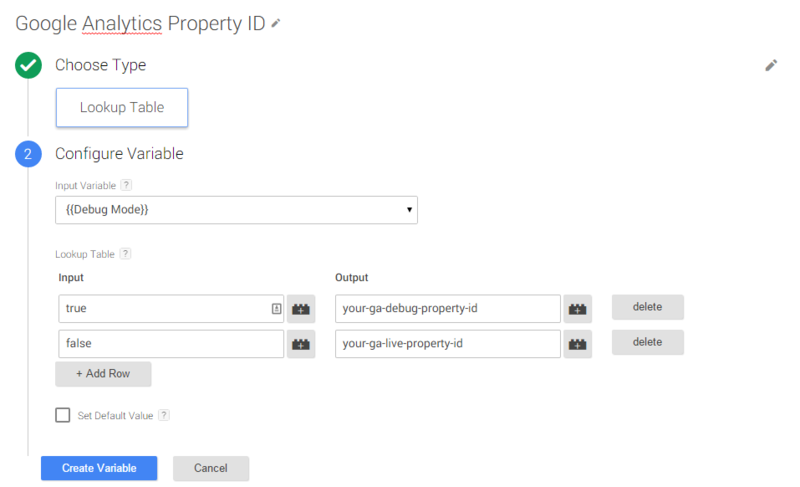 You could then create a Debug Mode variable and use that in a Lookup Table to determine whether to use the live or debug Google Analytics Property ID. Now, this is great for a lot of cases.